I scribble. I write. I express. I create. This entry was posted in Art, Caricature, Cartoons, Drawing, Graphic Design, illustration, photoshop, Portrait, sketch, Tamil, tribute, Typography, wacom and tagged #hashtag, #NotSoHappyPongal #SaveFarmers #SaveTNFarmers #SaveTamilnadu #People #Pongal #ஜல்லிக்கட்டு #savejallikattu #TNneedsJallikattu #IsupportJallikatu #jallikattu #tamilnadu #HappyPo, adobe Film poster, Alanganallur, AlanganallurProtest, alternative poster, amazing, art, artist, artoftheday, artwork, awesome, அடங்காநல்லூர், அலங்காநல்லூர், ஜ‌ல்லிக்க‌ட்டு, ஜல்லிக்கட்டு, தமிழன், பாரதி, ban, BanPeta, BanPetaIndia, best, bestoftheday, bollywood, bull, bull fight, Cartoon, cartoons, chennai, cinema indian film, concept, concept poster, conceptart, culture, design, deviantart, digital illustration, digitalart, digitalpainting, doodle, draw, drawing, enpowerment, Facebook, Fanmade, Fanmade poster, farmer, girls, good, google, Graphic Design, HappyPongal, happypongal2017, illustration, India, indian, indian girls, indian movie, instabest, instadaily, instagood, instagram, instart, ISupportJallikattu, IsupportJallikatu, Isupportjalllikattu, jallikattu, JallikattuProtest, JusticeForJallikattu, lion, love, madras, minimal, minimalism, minimalposterofindia, movie, movie poster, NotSoHappyPongal, painting, people, peta, photo, photoshop, pic, picoftheday, picture, pongal, pongal2017, Poster, power, protest, save, save farmer, savefarmers, savejallikattu, SaveTamilnadu, savetnfarmers, sivadigitalart, sivakumar, sketch, society, Sports, SupportAlanganallurProtest, tag, Tamil, tamilatchi, tamilnadu, thamizhatchi, TNneedsJallikattu, tradition, traditional, tumblr, twitter, utv, utv pictures, veeram, viral, wacom, walt disney, walt disney pictures, WeDoJallikattu, women, Women Empowerment, wordpress on January 20, 2017 by Sivadigitalart. Alanganallur protest against jallikattu ban! 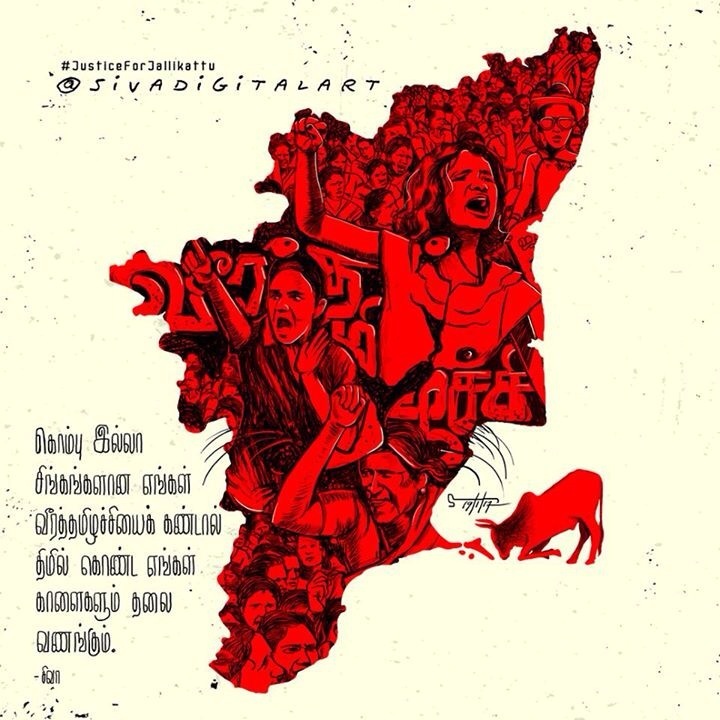 இது அறப் போராட்டம், அமைதிப் போராட்டம், என்றும் வரலாறு பேசும் எங்கள் தமிழனின் அடையாளப் போராட்டம்….! This entry was posted in Caricature, Cartoons, Drawing, Graphic Design, illustration, photoshop, Portrait, sketch, Tamil, Typography, wacom and tagged #hashtag, #NotSoHappyPongal #SaveFarmers #SaveTNFarmers #SaveTamilnadu #People #Pongal #ஜல்லிக்கட்டு #savejallikattu #TNneedsJallikattu #IsupportJallikatu #jallikattu #tamilnadu #HappyPo, adobe Film poster, Alanganallur, AlanganallurProtest, alternative poster, amazing, art, artist, artoftheday, artwork, awesome, அடங்காநல்லூர், அலங்காநல்லூர், ஜ‌ல்லிக்க‌ட்டு, ஜல்லிக்கட்டு, தமிழன், பாரதி, ban, BanPeta, best, bestoftheday, bollywood, bull, bull fight, Cartoon, cartoons, chennai, cinema indian film, concept, concept poster, conceptart, culture, design, deviantart, digital illustration, digitalart, digitalpainting, doodle, draw, drawing, enpowerment, Facebook, Fanmade, Fanmade poster, farmer, good, google, Graphic Design, HappyPongal, happypongal2017, HumanRightsViolationInIndia, illustration, India, indian, indian movie, instabest, instadaily, instagood, instagram, instart, ISupportJallikattu, IsupportJallikatu, jallikattu, JallikattuProtest, JusticeForJallikattu, love, madras, marina, marina beach, marinaprotest, minimal, minimalism, minimalposterofindia, movie, movie poster, NotSoHappyPongal, painting, people, peta, photo, photoshop, pic, picoftheday, picture, pongal, pongal2017, Poster, power, protest, save, save farmer, savefarmers, savejallikattu, SaveTamilnadu, savetnfarmers, sivadigitalart, sivakumar, sketch, society, Sports, SupportAlanganallurProtest, tag, Tamil, tamilnadu, TNneedsJallikattu, tradition, traditional, tumblr, twitter, utv, utv pictures, viral, wacom, walt disney, walt disney pictures, WeDoJallikattu, wordpress on January 18, 2017 by Sivadigitalart. 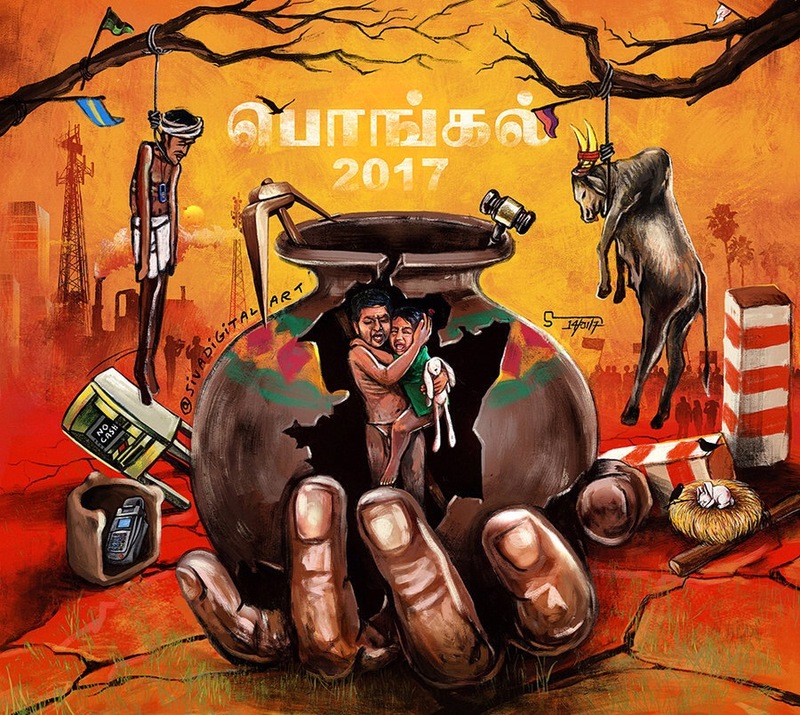 Pongal 2017 | Not so happy pongal. This entry was posted in Art, Caricature, Cartoons, Drawing, Graphic Design, illustration, Nature, photoshop, Portrait, sketch, Tamil, tribute, Typography, wacom and tagged #hashtag, #NotSoHappyPongal #SaveFarmers #SaveTNFarmers #SaveTamilnadu #People #Pongal #ஜல்லிக்கட்டு #savejallikattu #TNneedsJallikattu #IsupportJallikatu #jallikattu #tamilnadu #HappyPo, adobe Film poster, alternative poster, amazing, art, artist, artoftheday, artwork, awesome, ஜல்லிக்கட்டு, பாரதி, ban, best, bestoftheday, bollywood, bull, bull fight, Cartoon, cartoons, central government, chennai, cinema indian film, concept, concept poster, conceptart, culture, death, design, deviantart, died, digital illustration, digitalart, digitalpainting, draw, drawing, drought, enpowerment, Facebook, Fanmade, Fanmade poster, farmer, farmers, festival, god, good, google, Graphic Design, HappyPongal, happypongal2017, harvest, harvest festival, illustration, India, indian, indian movie, instabest, instadaily, instagood, instagram, instart, ISupportJallikattu, IsupportJallikatu, jallikattu, judgement, law, love, madras, media, minimal, minimalism, minimalposterofindia, movie, movie poster, NotSoHappyPongal, painting, people, peta, photo, photoshop, pic, picoftheday, picture, politician, politics, pongal, pongal2017, Poster, power, protest, save, save farmer, savefarmers, savejallikattu, SaveTamilnadu, savetnfarmers, sivadigitalart, sivakumar, sketch, society, Sports, state government, students, suicide, sun, support, supreme court, tag, Tamil, tamilnadu, TNneedsJallikattu, tradition, traditional, tumblr, twitter, utv, utv pictures, village, viral, wacom, walt disney, walt disney pictures, WeDoJallikattu, wordpress on January 15, 2017 by Sivadigitalart. தமிழ் மண், மண(ன)ம், வீரம் போற்றும் ஜல்லிக்கட்டு நமது உரிமை. Jallikattu has been known to be practiced during the Tamil classical period (400-100 BC). This entry was posted in Art, Caricature, Cartoons, Drawing, Fan Art, Graphic Design, illustration, logo, Nature, photoshop, Portrait, sketch, Tamil, tribute, Typography, wacom and tagged #hashtag, adobe Film poster, alternative poster, amazing, art, artist, artoftheday, artwork, awesome, ஜல்லிக்கட்டு, பாரதி, best, bestoftheday, bollywood, bull, bull fight, Cartoon, cartoons, chennai, cinema indian film, concept, concept poster, conceptart, culture, design, deviantart, digital illustration, digitalart, digitalpainting, draw, drawing, enpowerment, Facebook, Fanmade, Fanmade poster, good, google, Graphic Design, illustration, India, indian, indian movie, instabest, instadaily, instagood, instagram, instart, ISupportJallikattu, jallikattu, love, madras, minimal, minimalism, minimalposterofindia, movie, movie poster, painting, people, photo, photoshop, pic, picoftheday, picture, Poster, power, save, savejallikattu, sivadigitalart, sivakumar, sketch, society, Sports, tag, Tamil, tamilnadu, TNneedsJallikattu, tradition, traditional, tumblr, twitter, utv, utv pictures, viral, wacom, walt disney, walt disney pictures, WeDoJallikattu, Women Empowerment, wordpress on January 8, 2017 by Sivadigitalart. Dangal 2016 | FanArt Poster. Dangal is a 2016 Indian biographical sports drama film directed by Nitesh Tiwari. Starring Aamir Khan as Mahavir Singh Phogat, who taught wrestling to his daughters Geeta Phogat and Babita Kumari. 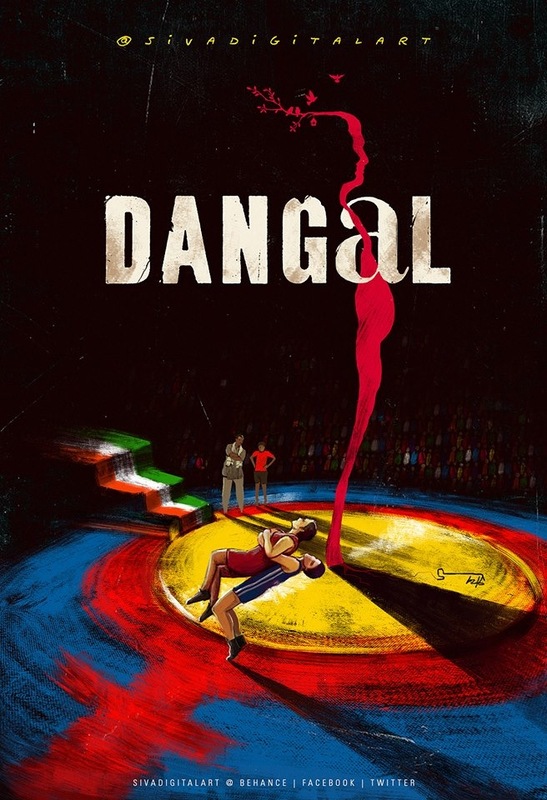 “Dangal” is the Hindi term for “a wrestling competition”. A salute to the Real Hero of Dangal Movie: Mahavir Singh Phogat with his daughters & Indian Wrestling Stars. This entry was posted in Art, Caricature, Cartoons, Drawing, Fan Art, fan made, film, Film Poster, Film Review, Gift, Graphic Design, Greeting, illustration, kollywood, logo, movie, photoshop, Portrait, sketch, Tamil, Typography, wacom and tagged #hashtag, aamirkhan, adobe Film poster, alternative poster, amazing, art, artist, artoftheday, artwork, awesome, best, bestoftheday, bollywood, Cartoon, cartoons, chennai, cinema indian film, commonwealthgames, concept, concept poster, conceptart, Dangal, dangal fanart, design, deviantart, digital illustration, digitalart, digitalpainting, Disney Film FanArt Indian Women, draw, drawing, enpowerment, Facebook, Fanmade, Fanmade poster, girl, good, google, Graphic Design, Hindi, illustration, India, indian movie, instabest, instadaily, instagood, instagram, instart, love, madras, Mahavir, Mahavir Singh Phogat, minimal, minimalism, minimalposterofindia, movie, movie poster, Nitesh Tiwari, olympic, painting, people, Phogat, photo, photoshop, pic, picoftheday, picture, Poster, power, Singh, sivadigitalart, sivakumar, sketch, society, Sports, tag, Tamil, tumblr, twitter, utv, utv pictures, viral, wacom, walt disney, walt disney pictures, Women Empowerment, wordpress, wrestling on December 30, 2016 by Sivadigitalart. Rest in peace Na Muthukumar sir (1975 – 2016). This entry was posted in Art, Caricature, Cartoons, Drawing, film, Graphic Design, illustration, kollywood, movie, photoshop, Portrait, sketch, Tamil, tamil film, tribute, wacom and tagged #hashtag, amazing, art, artist, artistontumblr, artistsontumblr, artoftheday, artwork, awesome, best, bestoftheday, Cartoon, cartoons, chennai, cinema, concept, Concept art, design, deviantart, digital art, digitalart, doodle, draw, drawing, drops, Facebook, Fanart, Fanmade, film, film poster, films, good, Graphic Design, illustration, India, indian, ink, ink spill, ink splash, inkspill, instagood, instagram, kollywood, legend, life, love, lyricist, madras, minimal, minimalism, Minimalist, movie, Muthukumar, Na Muthukumar, NaMuthukumar, national award, painting, paper, pen, people, photoshop, picture, portrait, Poster, respect, rest in peace, restinpeace, RIP, RIP Na Muthukumar, RIPNaMuthukumar, siva, sivadigitalart, sketch, sketching, society, songs, South Indian films, splash, splatter, Tamil, Tamil movies, tamil songs, tamilnadu, tribute, tumblr, twitter, typo, typography, wacom, winner, wordpress, writer on August 16, 2016 by Sivadigitalart. Featured in MetroPlus / The Hindu. Those were days when paint brushes, chalk pieces, clay and thermocol were my only weapons to be celebrated on Ayudha Pooja. A lot has changed over the years. But my passion for art and movies hasn’t. Just that I use a computer today! When I look back, it is a very exciting journey- from making fan art to designing official movie titles and posters. Kind words, appreciation and criticisms have always been a great source of motivation for me. Thank you The Hindu for the write-up on my movie interpretations. Thank you Hafsa Fathima. Thank you all for your love and wishes. Happy Ayudha Pooja. This entry was posted in Film Review and tagged #hashtag, 2015, amazing, art, article, artist, artistontumblr, artistsontumblr, artoftheday, artwork, awesome, Ayudha Pooja, chennai, clay, clay model, clay sculpture, Concept art, design, deviantart, dianosaur, digital art, digitalart, draw, drawing, english, Facebook, Fanart, Fanmade, Fanmade poster, featured, film, film poster, Film Review, films, Graphic Design, Hafsa, happiness, Happy, hindu, hollywood, India, joy, Jurassic park, madras, magazine, metroplus, miniature, model, movie, newspaper, pooja, published, Rex, sculpture, sivadigitalart, Spielberg, Steven Spielberg, T-Rex, Tamil, tamilnadu, the hindu, Trex on October 21, 2015 by Sivadigitalart.